One of the rapidly emerging business trends at the moment is what is known as Big Data. Wikipedia defines Big Data as “an all-encompassing term for any collection of data sets so large and complex that it becomes difficult to process using traditional data processing applications”. There are many aspects of yield management where Big Data can be and is being used to benefit hoteliers. Indeed both IHG and Marriott have been quoted as having used Big Data to improve the guest’s experience. However, there are also significant benefits to much simpler data analytics. I want to examine some of these benefits with respect to WiFi with a hospitality environment. As an example I will consider two different types of data sets with which I have worked and some of the inferences that can be drawn from them: gateway based data (where the data is obtained from the gateway used to connect the guest to the internet) and client based data (where the data is obtained from a connection client that the guest uses). Clearly just using the above information it is possible to significantly enhance both the guest experience and the benefit to the hotel simply with some thought around this basic gateway data. However, if we look at client data analytics, even more data and hence more information is available. In this case I am using client as a generic description for software that is utilised as part of your standard connection. Within the hospitality environment, this would include, among others, an iPass client. This now gives you the ability to obtain even more useful information such as average signal strength for a particular brand, hotel or even access point (AP). It also gives you the opportunity to compare providers or access point manufacturers. 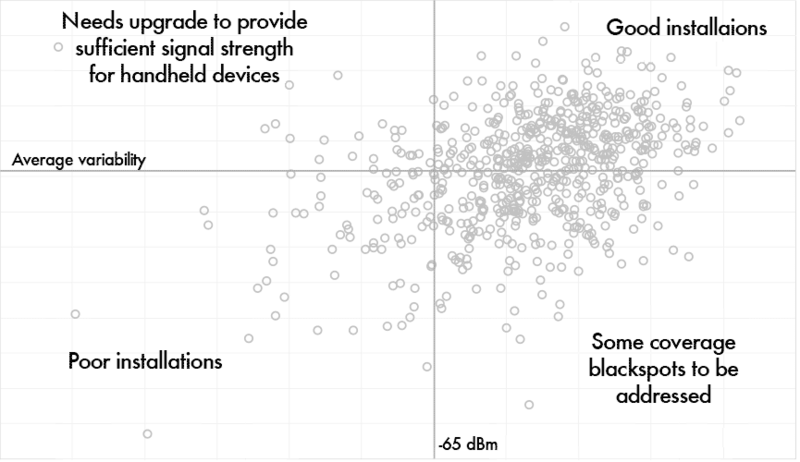 A pictorial comparison of average signal strength and variability of that signal strength across a group of hotels could result in a scatter plot such as this (I have added the implications). An owner of a number of different hotels could use information like this, together with usage information to ensure that expenditure is allocated in as cost-effective a manner as possible. The same sort of analysis and focus could be applied to APs within a hotel (although a longer sample period might be needed) and the information on signal strength and variability used to identify “coverage blackspots” and resolve them quickly rather than try and deal with the rather more troublesome “WiFi coverage was poor” comment on Trip Advisor. If this is the result of basic data analytics, what might be possible when hotels apply Big Data analysis techniques to their WiFi networks?